Moulmein Road, a road that has come to be associated with Tan Tock Seng Hospital, has for me, been a road of many journeys. It was in the area where my journey in education began, as well as one which served as a focal point for bus journeys with my mother in my early childhood. The entrance gate to Tan Tock Seng that once stood along Moulmein Road at Jalan Tan Tock Seng. My earliest memories of Moulmein Road are of these bus journeys; journeys taken at the end of the 1960s in days when Moulmein Green was still where bus rides for many started and terminated. It was at Moulmein Road that a journey on the notoriously unreliable STC bus service number 1 to the city would begin and where the journey taken to accompany my mother to the hairdresser would have ended. Corner of Moulmein Green and Rangoon Road (From the Lee Kip Lin Collection. All rights reserved. Lee Kip Lin and National Library Board, Singapore 2009). Sadly for me, little is left of the area to connect me with days now almost forgotten. The green has long since disappeared, as has the end of Rangoon Road that brought traffic out to the green. It was at the same stretch of Rangoon Road that the hairdresser’s shop would have been found, in a row of shophouses set in from the road. All that I now remember of the hairdresser is of the hours spent keeping myself entertained with only the multi-coloured strings of the string chairs, typical of the hair salons of the era, for company. 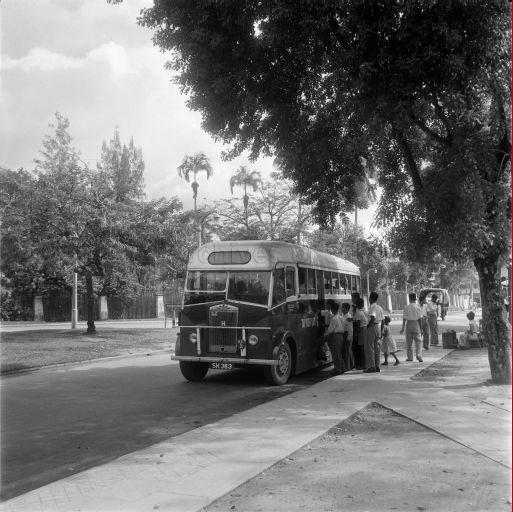 Moulmein Green was once a starting point or destination for many a bus journey (National Archives photograph). Another structure that has since gone missing, one that I developed a fascination for, was the rather quaint looking gatehouse (if I may call it that) of Middleton Hospital. Standing prominently across the green from Rangoon Road, it had long been a landmark in the area. It was the hospital’s crest, a black lion displayed over the entrance archway, that lent the area its name in the Hokkien vernacular, “or-sai”, Hokkien for “black lion”. The entrance gatehouse to Middleton Hospital at Moulmein Green (source: https://www.ttsh.com.sg). The hospital, sans the gatehouse, has since 1985, become Tan Tock Seng Hospital’s Communicable Disease Centre (CDC). For the time being, the cluster of buildings of the facility still serves its intended purpose having been set up as a hospital to isolate patients suffering from highly infectious diseases. The hospital, as the Infectious Disease Hospital, was established at Balestier Plain and was moved to the site in 1913. It acquired the name Middleton in September 1920 when the Municipal Council thought it fit to recognise the contributions of Dr W.R.C. Middleton. 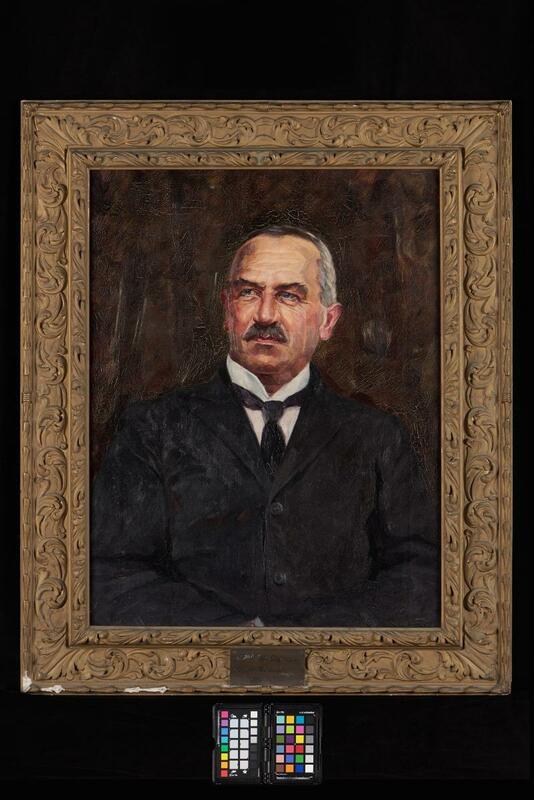 Dr Middleton’s long years of service as the Municipality’s Health Officer from 1893 to 1920, 27 to be precise, was marked by the huge improvements made in living conditions within the Municipality in the effort to contain the spread of diseases such as cholera. The black lion – still seen at the entrance of the CDC. The hospital, laid out as hospitals in the days when natural ventilation and separation mattered most in preventing of the spread of infectious diseases, features widely spaced and generously airy wards set in calm and green surroundings. Very much a thing of the past in land scarce Singapore, the CDC is now the last such hospital facility still functioning in Singapore. This may not be for very much longer though. It does seem that the facility will soon fall victim to the modern world that Singapore finds hard to escape from. The site has been earmarked for future residential development and the CDC will have to move out by 2018, by which time its new site adjacent to Tan Tock Seng Hospital should be up. With that, the CDC will become the National Centre for Infectious Diseases and the little that is still left to remind us of the legacy of Dr. Middleton is at threat of being further diluted. The view down Moulemin Road towards the area of the former Moulmein Green . Two notable buildings that have thankfully escaped the wreckers’ ball, both of which are associated with the control of tuberculosis, are to be found up Moulmein Road from the CDC. The two rather gorgeous buildings are now used by the Tan Tock Seng Hospital’s Tuberculosis Control Unit. One is the grand looking turreted structure that recently found fame through a Straits Times article at 144 Moulmein Road. The house had once been the home of a Chinese towkay, Mr Lim Soo Ban. Mr Lim was the proprietor of a goldsmith’s shop in Hill Street, maintained interests in a pawnshop and was on the board of Chung Khiaw Bank. He was also a prominent member of the Hakka community and contributed to the upkeep of the since exhumed Fong Yun Thai Hakka cemetery at Holland Plain. Mr Lim passed away in December 1952 as a bankrupt. Already ill with diabetes and tuberculosis, Mr Lim’s death came just two days after the bankruptcy adjudication order was delivered. Despite an order from the Official Assignee’s office to have funeral expenses capped at $5,000, Mr Lim was given a rather grand sendoff. The “grand funeral” is one which my mother, who then lived next door, well remembers. The funeral was reported to have cost $12,000 with a procession that was said to have stretched a mile long. 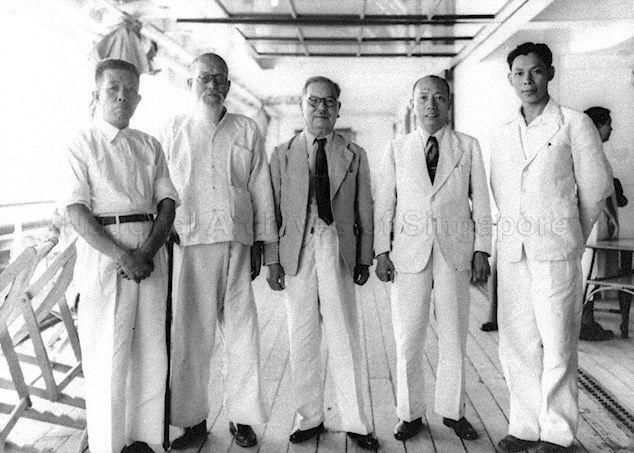 Lim Soo Ban, second from the right, photographed with Tan Kah Kee in May 1949 (National Archives of Singapore photograph). The house, I am told, was to remain empty for several years. Attempts were made by the Official Assignee to dispose of it before it came into the possession of Tan Tock Seng Hospital. It apparently saw use as a chapel for hospital staff before housing the Department for Tuberculosis Control, later the Tuberculosis Control Unit. 144 and 142 Moulmein Road, both gazetted for conservation in 2014. The house next door, 142 Moulmein Road, used more recently by the Department of Clinical Epidemiology, has also a rather interesting past. A residence for the Government Pathologist prior to the war and later a convent, it does in fact have a longer connection with the control of TB as compared to no. 144. As the Mount Alvernia convent, it was where the journey in Singapore for the nuns of the Franciscan Missionaries of the Divine Motherhood was to begin. 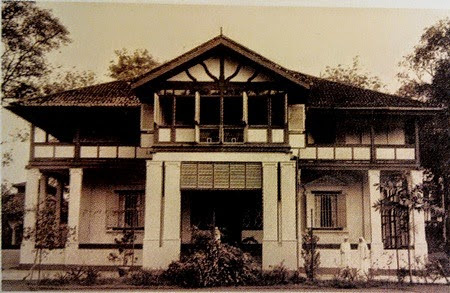 The order answering a call to serve at the TB wards at Tan Tock Seng, which was later run by the nuns as the Mandalay Road Hospital, arrived in 1949 and established their first dedicated residence and convent at No. 142. 142 Moulmein Road as Mount Alvernia in 1949. Buildings of the former Mandalay Road Hospital at Mandalay Road. The order of English nuns were also to be involved in the care of leprosy sufferers in Singapore. With the help of donations, the order would go on to establish Mount Alvernia Hospital in 1961. My maternal grandmother had worked for the nuns at no. 142 and had accommodation for the family provided in the servants’ rooms behind the house and it was during this time that my mother witnessed the grand funeral next door. Another view of 142 Moulmein Road today. Both 142 and 144 Moulmein Road have since been gazetted for conservation as part of the Urban Redevelopment Authority’s 2014 Master Plan. The 2014 Master Plan, a crystal ball into the future, does also predict a journey of transformation for Moulmein Road that may only have just begun.